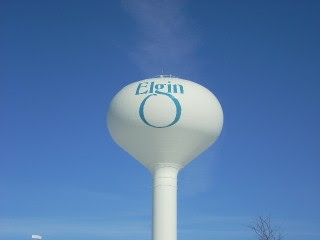 The city of Elgin is located approximately 45 miles northwest of the Chicago "Loop" on the Fox River. Most of Elgin lies within Kane County, with a portion in Cook County. As of the 2000 census, the city had a total population of 94,487, making it the eighth-largest city in Illinois. As of 2007 Elgin's population is estimated to be at 101,903, and the Northeastern Illinois Planning Commission forecasts a population of 167,375 in 2030. The city's neighbors include Sleepy Hollow & West Dundee to the north, Hoffman Estates, Streamwood & Bartlett to the east, South Elgin to the south, and Gilberts to the west. According to data from the Northern Illinois MLS there were 821 sales of single family homes in 2007, down from 1,183 in 2006. The median sales price was $230,000.00, this was a decrease from $233,300.00 in 2006. Marketing times were an average of 122 days on the market, up from the 2006 average of 90 days. As of February 19, 2008 there are 981 active listings of single family detached homes in the MLS. At the 2007 level of absorption this is 14.34 months of unsold available inventory. A 3-4 months supply of inventory is considered "in balance", this level is an oversupply. To recap 2007 for detached homes, sales volume was down -30.60%, median sales prices up +1.41%, and the days on the market were up +35.55%. This market is oversupplied and the 981 active listings have already been on the market an average of 202 days. The condo/townhouse market had 385 sales, down from the 533 properties that sold in 2006. Sales prices are stable with the 2006 mean sales price of $187,000.00, unchanged for 2007. Marketing times were an average of 105 days on the market, an increase from the 2006 average of 79 days. There are 298 active listings of attached homes in the MLS. Based on the 2007 level of absorption this is 9.31 months of unsold inventory. The condo/townhouse market is over supplied, sales volume was down -27.76%, sales prices have remained stable, the days on the market increased +32.91%. The 298 active MLS listings have already been on the market an average of 166 days.